Waterwatch is a water quality monitoring initiative established in 1992 through which people in the community are actively involved in monitoring the health of local waterways and catchments. In the Adelaide and Mount Lofty Ranges region, Waterwatch was run by the Adelaide and Mount Lofty Ranges Natural Resources Management Board through the NRM Education program. The Waterwatch program in the Adelaide and Mount Lofty Ranges region has now been replaced by the Engaging with Nature program, which expands upon the water monitoring activities to also include terrestrial monitoring and taking action components. This website is currently only being maintained as a warehouse for the large range of historical resources that were developed to support the Waterwatch program. If updated or new resources are developed by the NRM Education program to support Engaging with Nature and other education and community action for sustainability, the old resources will be removed from this site. The new resources can be found on the main NRM Education website. For more information about natural resources management in the Adelaide and Mount Lofty Ranges region, please visit the Adelaide and Mount Lofty Ranges Management Board website. Wetlands are among the most important and productive ecosystems on Earth, providing habitat, water and an abundant food source for a diverse range of animals including birds, frogs, invertebrates and fish. Wetlands become refuge areas for plants and animals in times of drought and are nurseries for fish and migratory bird populations. As water travels slowly through a wetland, a number of different processes occur which help to improve water quality and the overall health of a catchment area. In the past, most wetlands were viewed as wastelands and were often reclaimed for farming, housing and other land uses. Today we understand the vital functions of wetlands and better appreciate their environmental, social and economic value and significance. Governments and communities all over the world are involved in wetland management, conservation, restoration and construction projects. 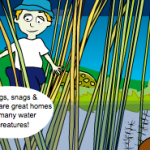 What is an aquatic macroinvertebrate? Aquatic is another word for water. The macroinvertebrates in this section are the ones that spend some or all of their lives in fresh water. Macro means they are big enough to see with your eyes, and an invertebrate is an animal without a backbone. Some are soft and squishy, some have a hard skeleton on the outside of their body and others live in shells! Aquatic macroinvertebrates range from insects and crustaceans to molluscs and worms, and are a vital part of the food chain in aquatic and terrestrial environments. They help to break down leaves, bark and twigs that fall into the water, and can even change their environments by moving soil, sand or pebbles around. Scientists can use the number and types of aquatic macroinvertebrates in a waterway to determine how healthy it is. Vegetation varies across area, contact us for the landscape design services. Garden landscaping is an art and it plays an important role to enhance the beauty of outside areas. Gardening is leisure and a professional activity. Landscape enhances the beauty and it’s a good solution to manage the cost in an efficient way. It should not dull and boring it needs to be groomed to give a good impression. The outside appearance makes a clear reflection of the surrounding areas so it must look best always. The outdoor space designed in a way to give a pleasant experience to spend time and get relax. The designing plays an important role in good quality services to maintain a garden. A beautiful outdoor landscape can enhance the beauty and can increase the value of your property home or a business. Mostly the designing of the gardens is done by some professionals and experts. The following steps will be helpful for designing the outdoor space. Outdoor spaces are as important as the interior part. Manage the sitting area to handle when overcrowded. Decorating the outdoor of a garden is a creation that stays season to season and year to year. Some people come to enjoy the nature of landscapes. Plant some trees and shrubs in the garden. Trees can block the heat of sun and water drainage. They provide shade for the surface and these are aesthetically pleasing to a person. Use some native plants to beautify the garden. It can also save time and money. Adding colorful flowers in a garden enhance the looks. Choose the colors effectively. Use lights at night to enhance the beauty. Outdoor industrial pendant lighting can bring a huge difference in the garden’s look even when plants are lighted they looks really beautiful. The LED light plants are more effective to give an elegance look. Fencing is also a good idea to add up beauty, but it may quite costly. Building Gardens in a Beautiful Manner. Collect your gardening tools and gloves to start planting. Be aware for the cleaning of the plants and their post to avoid from diseases. First check the soil properly. Keep the garden hydrate to save the plants and flowers. Don’t overgrow plants and shrubs in a garden it may not give you a pleasant look. So make a careful selection of plants and colors. You can also grow vegetables of your interest. Grow beautiful flowers like rosemary, jasmine to get a pleasant fragrance in your garden. Maintain the lawn properly the lawn grass needs to be in control never dirty or too high. Water the grass properly doesn’t let it dry. Keep growing and planting new flower beds and shrubs with different shades and properly seed them to grow. Provide shade for the plants when heat strikes. You may hire a landscape garden for guidance. Bringing new life is good to grow the garden by adding fresh plants, seeds and shrubs. Maintain the garden trees that really need care. Feed plants properly and spray the oil to keep them save. Fencing, decking and gardening furniture also adds beauty make a good selection. The overall look must match to the theme it doesn’t look odd.